One of the most common complaints of guitar players is lugging around amplifiers. Even if you are just looking for a nice practice amp, most full-size amps are a pain to get up the stairs. Don’t even think about trying to use a Marshall Stack just for some street performances. Plus, where are you going to get an extension cord long enough? Thankfully, some of the leading names in guitar amplification are making portable mini/micro amps that are easy to move from one place to another. And, most of these amps use some kind of battery for power, meaning you can set up practically anywhere. These aren’t touring rigs by any stretch, but they are perfect of when you need a solid amp for practicing or for when you want to show off your skills at the county fair. A feisty amp that goes where you go. Yamaha’s THR10C brings you new levels of audio convenience and quality. This amp features Yamaha’s Virtual Circuitry Modelling (VCM) technology, which recreates the fidelity of a tube amp. VCM also allows you to store up to five user settings. Dial in your favorite tones and sounds, then lock them in and you are ready to go at the drop of a hat. There are five classic amp models to choose from. These models are Brit Blues, American Blues, Class A, Mini, and Deluxe models. Plus additional modes for acoustic guitar, bass, and other instruments that allow for greater versatility of use. The acoustic setting is absolutely brilliant. The power and fullness are what you’d expect from a big expensive tube amp. The volume, gain, mid, treble, and bass control knobs that are not digital, which adds more authenticity to the vintage sound. The response and dynamics on this amp are impressive. You won’t believe you’re playing on a portable boutique amp. There are two FX control knobs — one for standard effects like chorus, phaser, and tremolo. And a second dedicated control for delay and reverb. The range of tonal and sound possibilities is quite expansive for such a small package. Crispy clean tone and sound or crunchy overdrive when the gain is ratcheted up, you are sure to find the sound and style that works best for you. Additional features include a built-in tuner, AUX and USB inputs with a dedicated volume control knob, headphones jack, Cubase AI Recording software, and a stationary chrome carrying handle. You can plug in a mobile device and this amp doubles as a brilliant sound system. Hook up a microphone and some speakers, and you will have a handy PA system. Made with high-quality electronics and a strong external metal casing, the Yamaha THR10C is making moves in the area of portable amplification. VCM recreates vintage tones and sounds. A compact combo amp capable of handling any audio issues while on the move. With two channels, this amp doubles as a guitar amp and PA system. The MIC/LINE channel features a two-in-one input jack, which means you can plug in a standard quarter-inch cable jack, or three-prong XLR microphone cable. EQ controls for bass and treble, as well as built-in Delay/Reverb effects. The GUITAR/INSTRUMENT channel features bass, middle, and treble EQ controls. Delay, reverb, chorus, flanger, phaser, and tremolo FX are right at your fingertips. There is also a built-in tuner, AUX line input, and a headphones output. The COSM digital amplifier gives you six different amp models to choose from. Separate volume and gain control knobs allow you to get a very nice overdriven sound. The CUBE can run for up to 7 hours on battery power, or it can be plugged in using a DC adapter. The speaker is slightly angled which means it’s ready-made for busking on the street or barking at the local fair. Also a great amp for practice rooms or when teaching guitar lessons. Durable and strong external housing. 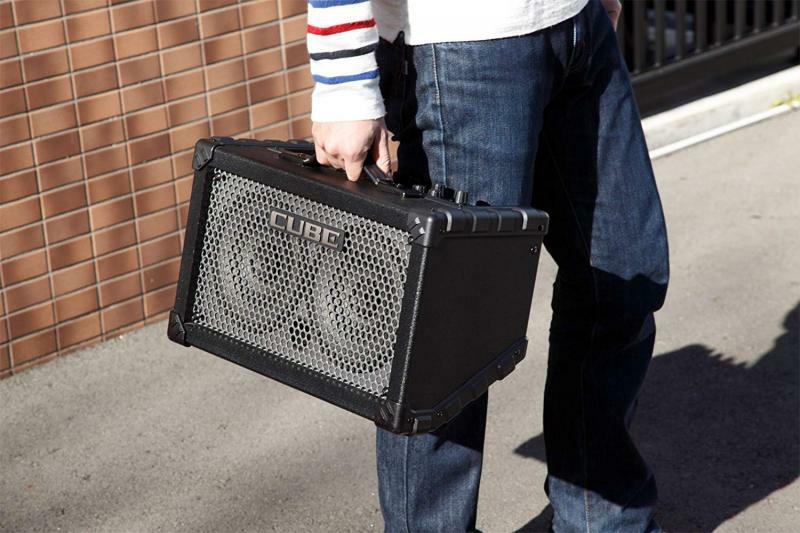 Perfect for busking or using as a mini-PA system. Built-in tuner and digital FX. Amp modeling lacks in authenticity. Batteries drain quickly when using 2 channels at the same time. Roland has packed all kinds of features into an itty-bitty box. 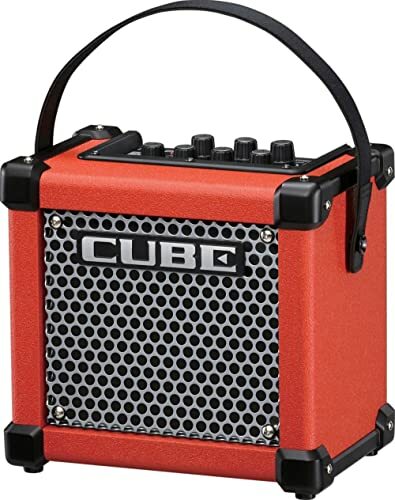 The Micro Cube is a single-channel, 3W combo amp that can run on batteries or with the AC adapter included. Basically, it is a smaller version of the Roland Cube. The COSM amp features eight different guitar amp models, including a JC-120 amp model. Gain, volume, and tone knobs offer a good range of sound potential: crunchy overdrive or a nice, clean setting. You won’t get any thinness or hiss when playing at high levels. The built-in delay and reverb are quite nice and surprisingly responsive from such a tiny amp. There are four different digital effects that provide further dynamic and diverse sounds. With a digital tuner, headphones output, and an AUX input built-in this amp is great for practicing or impromptu jam sessions on the beach. A carrying strap and extra protection along the edges and corners make this a very durable little amp. Inexpensive and made with Roland’s dedication to quality, the Micro Cube is a mighty mouse that can pack a wallop. 8 COSM amp models with gain and volume controls. Digital FX and built-in tuner. Difficult to save custom/personal settings. 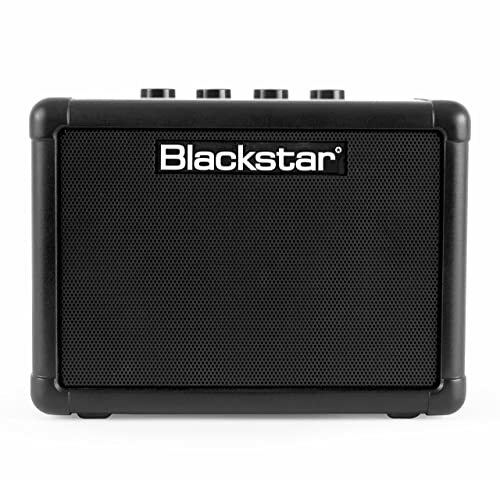 The Blackstar offers you great-sounding audio technology in very compact size. Weighing less than 6 pounds, this amp is made to move. It takes up very little space and is very easy to transport. Its patented Infinite Shape Feature (ISF) features a range of amp tones, from US to UK styles and anywhere in the middle. A digital “tape” delay effect boosts resonance and adds more dimensions to your guitar’s sound. This control is more similar to a reverb effect than a full digital delay. An independent gain control knob lets you shape the overdrive sound from a low growl to a big bite. Quite a surprise coming from a mini amp. The line in/MP3 jack gives you the option to use the Blackstar as a speaker that connects to your desktop, laptop, or mobile device. Using the Blackstar as a speaker means you aren’t going to run down your car battery to pump the jams when you’re tailgating in a parking lot or hanging around the campsite. There is a headphone jack for practicing without any distractions. Don’t let the size of this amp fool you. With the Blackstar FLY3, you’ll be able to enhance any musical situation. Very small, easily portable guitar amp and speaker. Battery powered or DC adaptable. Excellent tone and overall sound. Great for practicing or playing music at small social gatherings. Adorable! If only Frodo and Sam had formed a rock band. The Marshall MS2 Micro amp literally allows you to play from the hip. At less than a pound and with a handy belt clip, you can strut your stuff anywhere, anytime with genuine Marshall tone and sound quality. This microamp can switch between clean and overdrive channels. Just a single watt of power that sill provides you with the full tone of a Marshall right in the palm of your hand. 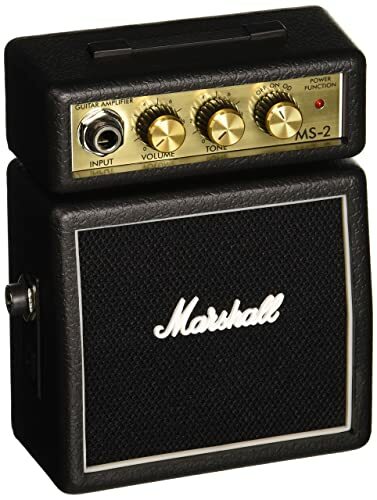 The Marshall MS2 has a fabulous clean sound and can produce a decent overdriven sound. But don’t expect the same face-melting power of a full-size Marshall amp. Volume and tone control knobs, plus a headphone output. Practice wherever you want without making a nuisance. Entirely battery-powered, it is recommended to use Polaroid 9V batteries for the best performance. This amp looks just like a Marshall stack if it had been shrunk with some kind of laser. Marshall-quality engineering and construction make this pocket-sized amplifier a fun option for your sonic needs. Genuine Marshall tones and sound. Belt clip for mobile music-making. Not powerful enough for busking on noisy streets. The Pignose 7-100 is almost like a suitcase amplifier. It comes complete with hinges and a U-shape latch so it opens easily and you can get access to the speaker and batteries. The housing has metal corner protectors with rough and rugged vinyl covering. The frame is wood, and it also has a chrome carrying handle. An incredibly easy amp to use. There is one control knob for power and volume level, shaped like a pig’s snout. For guitar students, this is a great first amplifier. It is useful, practical, and economical. The clean tone on this little piggy is exceptionally clear and bright for its size. When you turn up the volume you will notice a wee bit of drive start to kick in, but nothing that is overpowering or overly-distorted. The Pignose features a preamp output jack. It can be plugged into a recording console or even used as its own little preamp. The five-inch speaker is quite tough and works well with the 5W amplifier. 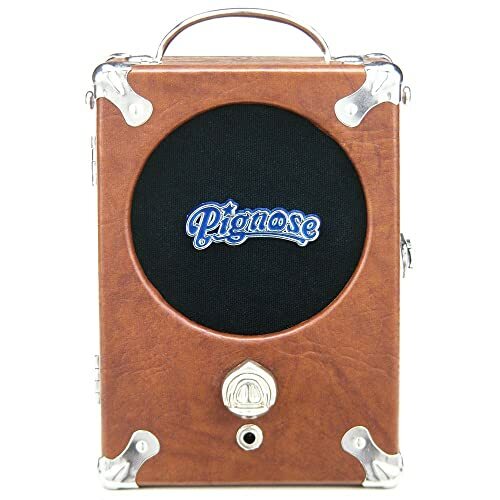 The Pignose can run on batteries or be plugged in with an AC adapter. 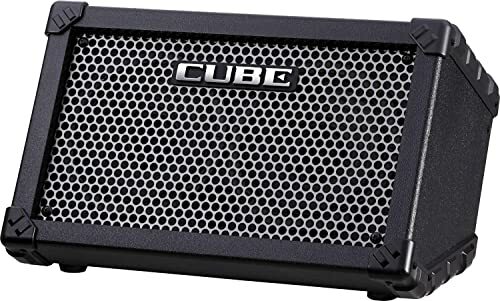 Not only does this amp work well with guitars, but it can also be used with any instrument that has some kind of pickup. It can even be used as a small PA or microphone amp. Easy to use with inside space for storing cables. A retro drive-thru speaker and amplifier? Aces, daddy-o. In aqua blue and raised faux-chrome lettering and speaker cover, the Honey Tone has a look straight out of the 1950s hot rod scene. 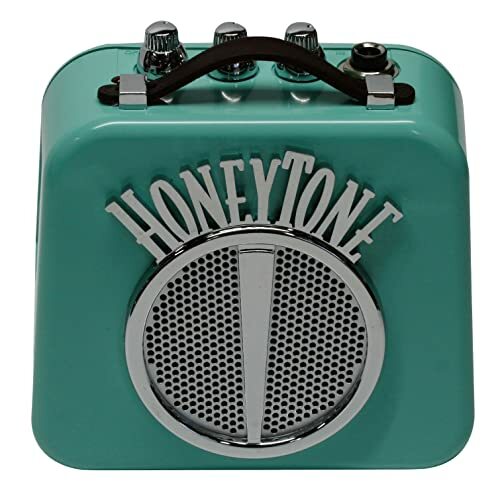 The Honey Tone is a mini amp that has great clean and overdriven sounds. It is quite small, weighs very little, and comes equipped with a metal belt clip. It is powered by a 9V battery for fun on the go, or it can be powered with an AC adapter when you are swooning by the Moon River. Play some of that old Buddy Holly through this solid little amp, while roller-skating and no one will ever call you a square. There are three dedicated control knobs; volume, tone, and overdrive. The clean setting is a vintage sound to match its retro appearance. It is clear and crisp with ample amounts for volume for practicing or getting real in a coffee shop. The overdrive gets pretty hot for such a small amp. There isn’t any loss of clarity when you crank up that overdrive either. At a rock-bottom price, the Danelectro Honey Tone will have you bopping and hoping but with money to spare for milkshakes and hula-hoops. Very small and easily portable. Vintage clean and overdrive sounds. Packs a pretty little punch. Belt clip and leather carrying handle. Speaker decal and lettering are plastic. A portable mini amp with all the style and sound of a full-sized Fender amplifier. A petite and precious little replica of the Fender ’57 Twin. It has the same tweed covering and brown woven-mesh grille. Even the control knobs are the original “chicken head” design. This little guy boasts two 2” speakers and 1W of pure unadulterated Fender sound and tone. Set the drive to zero and the volume to 12, and you’ll be amazed at how clear and bright the sound is. There is no distortion or crackling of any kind. Crank the drive and the volume to the max, and you will wonder if you are listening to a full-sized ’57 Twin or not. The range of sound possibilities is truly mind-blowing because it is such a small amp. But, hey, we are talking about a Fender product here. They don’t do anything halfway. From a soft bluesy tone to an outright grungy overdrive, your sound and style are within reach. It also features a headphone output for when you need to practice without waking the dogs. 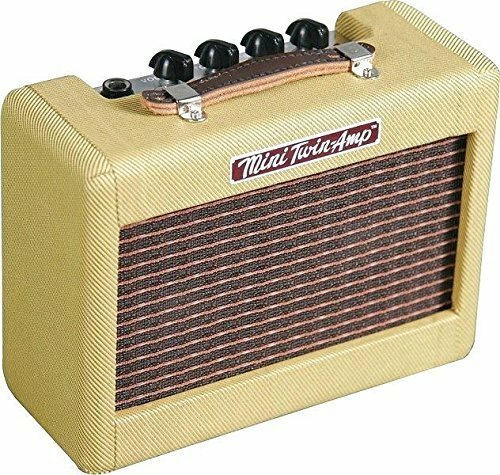 Powered with a 9V battery or DC adapter, lightweight, and easy to carry with a nice leather handle on top, the Fender Mini Twin is a sight to see, and a joy to use. Authentic Fender tone and sound. Clear and bright clean setting. A wide range of tone and sound possibilities. The original appearance of a full-sized ’57 Twin. Not ideal for acoustic guitars. Who knew mini/micro amps were so much fun or that they had gotten so dynamic? Mini portable amps are usually designed for practicing, certainly not for use with a full band. And while they may work well in small venues like a café, some are more geared towards street performances and busking. If you are interested in putting down a hat and looking for some spare change, then we suggest a portable amp with a higher wattage. Especially for playing outdoors, the little bit extra will help give you more volume that often comes in handy on noisy, bustling streets. However, if you are looking for a practice amp you can zip across town with, mini/micro portable amps with 1W or 2W will be your best bet. So, What’re The Best Portable Amplifiers? Each of the portable amplifiers we reviewed are excellent, so we had a hard time deciding which one is the absolute best. First of all, it is a real Fender amp. Second, it is very affordable. It sounds and looks just like the original, albeit with less force and power. It is highly versatile and extremely easy to transport. Dial in fantastic clean sounds or get your hands dirty with the kind of overdrive only a Fender could produce. 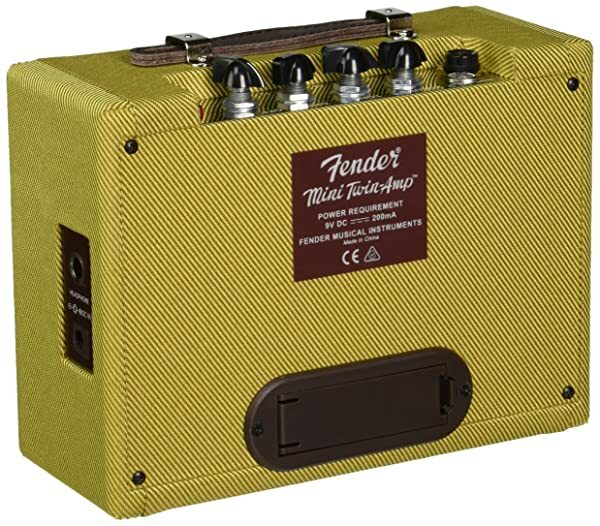 With this mini amp, you won’t want to leave your practice room. We really like the additional features on this portable amp. The COSm amp models sound great, and there are dedicated volume and gain controls. It can be used as a standalone sound system. It is very lightweight and comes with a carrying handle for getting around with ease. Enough power to play on the streets or relax at home with your headphones on. With all that said and done you should now know which portable amplifier is the right one for you. 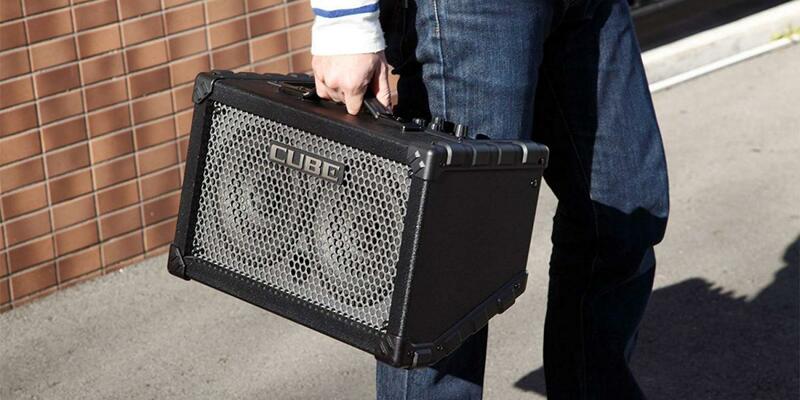 Have fun practicing or playing for a couple of friends with your new portable amp.